At Gary's Termite & Pest Control, we have many customers that depend on us to control scorpions on their property and prevent them from entering their homes and businesses. Our East Texas soils and temperatures provide ample living conditions for scorpions and so their control and elimination must be planned for in any outdoor pest control procedures. After coming to your home or property, we'll first inspect the premises carefully, then consult on recommendations for control and prevention. It may involve some changes in landscaping, so be prepared. Scorpions are nocturnal, predatory animals that feed on a variety of insects, spiders, centipedes, and other scorpions. Scorpions are easily distinguished by their crablike appearance, pair of pincers, four pairs of legs, and long, segmented tail ending with an enlarged segment bearing a stinger. Although they have two eyes in the center of the head and usually two to five more along the margin on each side, they don’t see well and depend on touch. Scorpions can often be found around homes and in garages. It is a night feeder attracted to water, swimming pools, irrigated areas, or outside lights where food prey such as beetles, cockroaches, crickets, moths, and other insects are attracted as well. During the day it may be found in woodpiles, palm trees, and decorative bark or under loose boards, woodpiles, rocks, or the bark of trees. Scorpions may also enter homes in search of water. Common indoor places where it might be found are dark, cool areas in the bathroom or kitchen as well as crawl spaces, attics, and closets. They're also found in cracks and crevices of woodwork, behind baseboards, and inside walls. 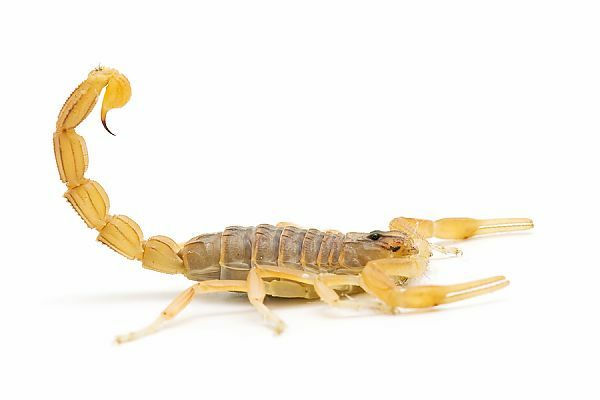 Scorpions gain entry into buildings through poorly sealed doors and windows, cracks in foundations, attic vents that aren’t properly screened, and through plumbing and other openings. Outdoors during the day, scorpions hide in burrows or debris, under wood, stones, or tree bark, and under floors of buildings in crawl spaces. Scorpions grow slowly. Depending on the species, they may take 1 to 6 years to reach maturity. On average scorpions may live 3 to 5 years, but some species can live as long as 10 to 15 years. For impregnated females, the gestation period may last several months to a year and a half depending on the species. A single female may produce 25 to 35 young. Scorpions are born live, and the young climb onto their mother’s back. The young scorpions remain on their mother’s back until their first molt. They assume an independent existence once they leave their mother’s back. Scorpions molt five or six times until they become full-grown adults. Scorpions generally hunt at night and use their stinger to paralyze prey. However, if the scorpion is strong enough to overpower its prey, instead of injecting its venom it will simply hold the prey and eat it alive. This conserves venom, which can take up to 2 weeks to regenerate, during which time the scorpion’s main defense is inactive. To prevent stinging encounters with scorpions, don’t leave shoes, boots, clothing items, or wet towels outdoors where scorpions can hide. Shake towels around the swimming pool and shake all clothing and shoes before putting them on. Wear gloves when working in the yard. Wear shoes outdoors, especially during the evening hours. A portable black light (UV light) may be used to survey for scorpions in and around the home. Scorpions glow brightly under black light and are therefore easily found and removed. Clean the yard by removing all trash, logs, boards, stones, bricks, and other objects from around the foundation of the home. Prune overhanging tree branches away from the house, because they can provide a path to the roof for scorpions. Don’t store firewood inside the house; bring in only wood to be directly placed on the fire, and check for scorpions before bringing the wood inside. Install weatherstripping around loose-fitting doors and windows. Caulk around roof eaves, pipes, and any other cracks that allow entrance into the home.